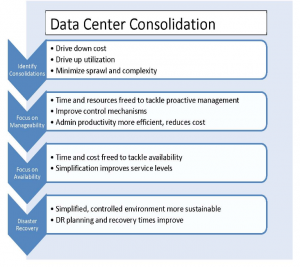 Data Center Consolidation | Elimination of 10 redundant data centers. Data center consolidation is not only an enormously complex task but one which can risk shutting down a company if not properly managed. Below is an overview of a global data center consolidation project we designed and managed that yielded significant cost reduction, improved SLA, provided the ability to support DR internal, and eliminated latency issues in China. The $23B international organization headquartered in France, need to eliminate the cost of operating 13 data centers worldwide. Americas: The North American Data Center Consolidation was completed in 14-months and three data centers were consolidated to one located in Indianapolis, IN. The site migration generated a comfortable reduction in cost, as well as improved reliability. European: Multiple sites in Europe were consolidated to Marcoussis, France which also housed the European data center and the focal point or hub to network activities. Redundant 400 Mb WAN MPLS and 100 Mb Internet capabilities were deployed. ENX communications were also consolidated and additional capability provided an improved level of redundancy and bandwidth to meet growing business demands. Building the facility and making it ready for production was only half of the effort. Following the build-out, consolidation from data centers located in Aubervilliers, France and Frankfurt, Germany were completed. Applications such as SAP and PLM from Hagenbach, Germany to Marcoussis, France were also completed. All email, SAP, PLM, Magnitude, as well as hundreds of supporting applications were relocated to Marcoussis. This provided the launching point of the SAP multi-instance project. The SAP multi-instance project was a logical separation of the single SAP core instance, then followed by the physical separation and lastly followed by a testing phase. The U.S. instance was migrated to the U.S. data center first, then the ASIA SAP instance was made ready for its migration to Singapore. ASIA: The third phase of the global data center consolidation project was the launch of data center operations in Singapore. Singapore was chosen for its centralized location, focal point of the Pacific Rim telecommunications, and availability of skilled data center facilities and experts already in place. Initial preparation work begin 4Q 2012, and was completed 1Q of 2013, focusing on the ASIA SAP Instance, email consolidation, etc. Moving the SAP instance to Singapore resolved numerous scanner timeout issues that were occurring in the ASIA plants when SAP was previously hosted in France. In a parallel path, our IT consulting company also launched a global disaster recovery project which provided the company with an internal disaster recovery solution among the key regional data centers, mirroring between the sites allowed anyone site to be a disaster recovery site for the other two. Our big data consulting services can help you manage and/or consolidate both domestic and international data centers. To learn more about how you can save money with our IT consulting company, contact HDPlus today!